We would like you to put us ‘under microscope’. We have spoken a lot about cleanliness. Time has come to prove it. Dirty Dozen Cleaning Services provides cleaning services to ensure all medical centers like clinics, hospitals and diagnostic centers are cleaned with disinfectants, organic cleansing elements and smart cleaning tools. 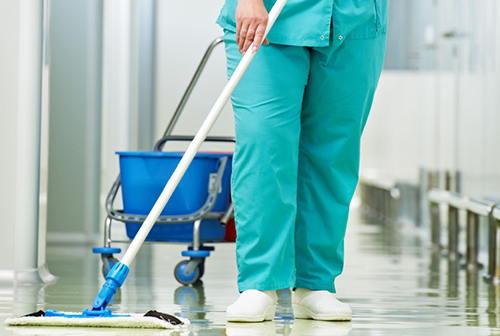 Our professionals make sure that every corner of the floor is wiped down or mopped to maintain 100% hygiene. Our professional hospital cleaning service is meant to protect you from getting contaminated from viral infections, thus keeping you safe and healthy. All personnel wear clean uniforms with ID badges, and use clearly branded vehicles. Equipment is kept clean and tidy and audited twice yearly by Regional Managers. We give attention to every detail. This is why our personnel are trained to look beyond the obvious surface areas and give attention to what’s often overlooked, such as finger marks, high dusting and ceiling fans.